A year ago, my writing career reached two early-career-type achievements. I happy-danced, praised God, shouted with joy, and prepared to tell everyone. It didn’t take long, however, for my mind to wander into the treacherous land of “what if.” You may know about “what-if-land,” too. First, I wondered what if this good thing happened, then that good thing. Before I knew it, pride, not joy in the grace of God, took over for a few minutes. I was almost to the Nobel Prize for Literature before God stopped me in my tracks. “Pretty proud of what I did for you, aren’t you, Leanna?” the Still Small Voice whispered in my heart. Oops. The fantasies in what-if-land glorified Leanna a bit more than they glorified God. A good bit more. I recognized pride, repented, and received forgiveness. My new beginning was that simple. Every new beginning is that simple. We see our sin, admit our guilt, repent, and reject the behavior. We choose a new path. The beginning is simple, but the difficulty lies in the carry-through. In the last days, Isaiah wrote, God will have a “day of reckoning” with everyone who’s proud and “lifted up.” He’ll be exalted and all prideful people will be abased. Women who take pride in their beauty, their clothes, their jewelry, and their possessions will be stripped of the adornments in which they’ve put their trust. Ladies, we may love the trappings of beauty, but God doesn’t. He wants beautiful hearts. Reject pride, embrace humility, and avoid the reckoning. Embrace pride until God takes us down a few notches and restores our humble heart. Which one of those choices is most appealing? Yep. Humility from the beginning. The point of a fresh start is to continue in a new way. It’s easy to slip back into old habits, but we can make a better choice. This year, I had an even bigger landmark moment in my writing, but I learned from my mistake. No happy-dancing. No trips to what-if land. I simply thanked God and gave Him credit for what He did. I don’t claim to always get it right, but I want to be the one who responds in a godly way from the start every time, don’t you? Our standing with God is not enhanced by what’s on the outside, but what’s on the inside. My Mama used to say, “Pretty is as pretty does,” and she was right. No matter how attractive we are on the outside, it’s not true beauty unless our heart is beautiful – pure, kind, loving, and humble. 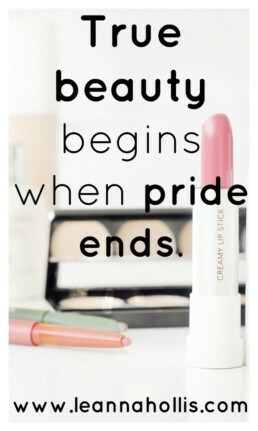 True beauty begins when pride comes to an end. Today let’s reject the trap of external beauty and prepare our hearts to celebrate our Savior by turning our focus on what matters to God – beautiful hearts. Tough times are planned for those who hold to pride and focus on external beauty, but there’s good news. God has wonderful plans for the humble in heart. We’ll not only see His glory and holiness, but He’ll provide all we need, even in the places of desolation. Thanks for the reminder Leanna. It seems like pride and gluttony are always creeping in for me. And then I think it all goes back to lack of trust in God – total dependence on Him and not me. Thanks for writing. Thank you, Janice. Same problem here. I think you’re exactly right. It does all go back to lack of trust in God. Bless you, sister, and hugs to Tony.